This Velvelettes biography features a Motown girl group whose fame was never astronomical, whose existence has stayed relatively drama-free, and whose original members have remained equals in billing. With common blood and a love of music, the Barbees sang backups for their uncle Simon on a 1957 Stepp record, which Mickey Stevenson produced. The Velvelettes would really develop from the amateur circles of Western Michigan University. About a dozen girls hit it off, musically, around a piano one day, and went on to perform at sock hops and other campus events. Before a fraternity talent show, junior music major Bertha and freshman friend Mildred reduced the group to a quintet. Younger sis Cal, a fast line-learner since her choir days, got lead status. The ninth-grader had the clout to recruit her best friend, high school junior Betty Kelley. Bertha's old singing partner Norma became the fifth member. The girls won the contest. The prize? A whopping $25 total! Oh, the victory made them happy. As did their "smooth like velvet" harmonies. And the group name that that self-assessment inspired. The Velvelettes weren't the Velvelettes' only fans. In 1962, a WMU student named Robert Bullock suggested they audition for his uncle. At a record company. In Detroit. Thanks to a snowstorm, the car trip from Kalamazoo (and bus ride from Flint for Norma) took about five hours. The voyage itself was ill timed, too, for it was a Saturday--aka, No Audition Day. The girls were crestfallen. Happily, a blast from the past--Mickey Stevenson--stepped in before they left. They got to perform before Berry Gordy after all. As of that day, they were Motown VIP artists. If this Velvelettes biography were a movie, the training montage would start here. Backups for other groups. An audience-determined win against the Supremes in an early Battle of the Stars. "There He Goes," which featured a Velvelettes-made melody, Stevie Wonder-blown harmonica, and Stevenson-produced sound through Independent Producers Group (IPG) Records. The group earned spotty success with "He Was Really Sayin' Somethin'," "A Bird in the Hand (is Worth Two in the Bush)," and "Lonely Lonely Girl Am I." As for other Motown singers, able producers like Stevenson, Whitfield, Ashford and Simpson, Sylvia Moy, and Clarence Paul guided their material. (Click here for my discography page.) 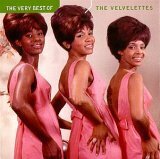 Nevertheless, the Velvelettes didn't quite mesh with their female colleagues. They were middle class, stayed in school (as allowed in their contracts), and came from a place called Kalamazoo. If there was a hip parade for the most popular and ambitious R&B/soul music stars, they weren't part of it. Artistically, they impressed: They sang several unreleased singles in French for producer Pierre Berjot. Commercially, they took off as easily as, well, a bird in the hand. Only a fair number of people were buying their records. Many of those who did didn't feel as attached to the singers. Because of their academic priorities, the Velvelettes couldn't join Motown's tours until about 1964, post-college degrees. By then, the Marvelettes, Vandellas, and Supremes were onstage veterans. That same year, Betty Kelley left the Velvelettes as an urgent Vandellas replacement. More personnel changes followed as the decade progressed due to familial duties and musical differences. During the flux, the group had its last quasi-hit, 1966's "These Things Will Keep Me Loving You." Cal Gill hung on. Sandra Tilley and Annette McMillan soon Velveletted alongside her. When the lead wed the Monitors' (later the Temptations') Richard Street, her own obligations to her marriage and education spelled the end of the Motown girl group at the close of the decade. Yet the Velvelettes biography goes on! The girl group had recorded no albums and a meager number of singles. But failure didn't crush them. While other Motowners waded through fading fortunes, smoldering grudges, and personal demons through the 1980s, the Velvelettes pretty much kept their lives together. In 1984, a one-time reunion show at a black women's conference turned into an official group revival. Work in the U.K. (at Motorcity) and concerts throughout Michigan, Canada, Japan, and Europe have almost made up for the tardy touring start! The double-CD Motown Anthology also shows the ladies' talents later rather than sooner. Despite divorces across the board, the four original members have led otherwise stable lives. Second jobs in music teaching, hotel sales, human resources, and surgical nursing, plus community service commitments, have helped the singers connect to people in humbler ways. So, no agonizing extremes in the Velvelettes biography. Just a ride into the 21st century as smooth as Velvelettes can be. Throw a farewell kiss to this Velvelettes biography, and say hello to other Motown oldies artists on the homepage.